Each preset can have a localized name and description, icon and accelerator key. The Tool presets window can be opened from the presets toolbar. The toolbar is by default hidden and can be displayed from the View menu. 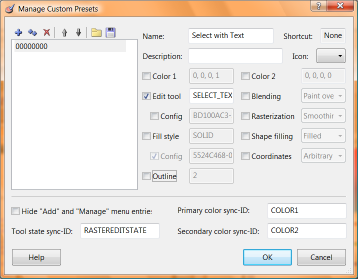 The toolbar contains the user-made presets and two buttons for adding new preset and managing existing presets. The image above shows the management dialog. Left part of the window shows list of available presets. The right part displays properties of the selected preset. HOW DO YOU RESET THE TOOL BAR LIKE IT WAS, i LOST ALL OF MY SELECTIONS TOOLS TRYING TO PUT THE BRUSH SELECTION ON TOP, HELP! i HAVE BEEN TRYING TO GET BACK MY SELECTION TOOLS AND NOW i HAVE NO TOOL ANYWHERE, THE CONFIGURE TOOLBAR HAS MY TOOLBAR ALL SCREWED UP AND i DO NOT KNOW HOW TO RESET IT. EVERYTIME I TRY TO GET MY TOOLS BACK, THEY TAKE ANOTHER ONE AWAY SO NOW I HAVE NONE. YES NONE. HELP ! ! HOW DO YOU RESET THE TOOL BAR SO ALL OF THE TOOLS SHOW ? ? ?